In the U.S. alone, close to 1% of all babies are born with some heart defect. While many can be remedied with simple, safe treatments or, even, basic surgical intervention, some cannot – in some cases, the care needed is too costly, too complicated or, simply, too far out of reach. 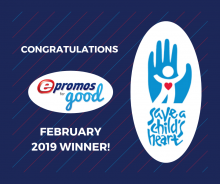 That’s where this month’s ePromos for Good winner Save a Child’s Heart (SACH) comes in. “Save a Child’s Heart is a global humanitarian organization providing life-saving cardiac care to children of all backgrounds, regardless of race, religion, gender, nationality, or financial status,” explains Cara Klein, a member of the Young Leadership Executive Board for SACH. Since its launch, SACH has sought to provide care and quality medical treatment for children suffering from congenital and acquired heart defects – children who, otherwise, wouldn’t have access to the critical care they need. In addition, SACH funds medical missions and medical training to ensure pediatric cardiac care is more widely available. To date, SACH has saved the lives of nearly 5,000 children in 57 countries, while training more than 120 medical team members worldwide. Programs are based in Israel, at the Wolfson Medical Center in Holon. Each day, a child from a developing country is saved at this facility, because of SACH’s tireless commitment and access. “I’m ecstatic to hear we were chosen,” Klein added. SACH will receive $500 in free promotional products from ePromos. We can’t wait to see what they do with it!